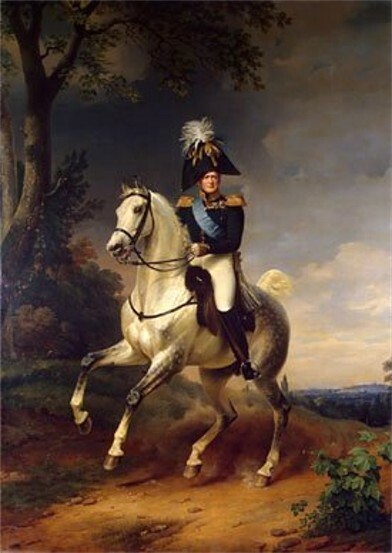 Alexander I, b 23 December 1777 in Saint Petersburg, d 1 December 1825 in Tahanrih. (Portrait: Alexander I.) Russian emperor in 1801–25, son and successor of Paul I. In the first part of his reign Alexander introduced a number of liberal reforms as a result of the influence of the Englightenment and of his friends and advisers, among whom were a number of Ukrainians (Viktor Kochubei, M. Speransky, Vasyl Karazyn, and others). He established government ministries and the Committee of Ministers in 1802, permitted non-nobles to purchase uninhabited lands in 1801, and issued an ukase on ‘free farmers’ in 1803. But a decade of exhausting wars with France, Sweden, Great Britain, and Turkey, and particularly the so-called Patriotic War with France in 1812, followed by the European campaigns of 1813–14 and the developing liberal-revolutionary movement within and outside the Russian Empire, turned Alexander towards a despotic, reactionary policy. On the international scene he supported the reactionary forces in Europe (Congress of Vienna, 1814–15), while at home he introduced the so-called military settlements, particularly in Ukraine, prohibited Freemasonry in 1822, and introduced reactionary cultural and educational policies. Alexander's policy towards the non-Russian peoples of his empire adhered to traditional Russian imperialism and centralism. Ukraine's autonomy was increasingly restricted, and its distinctive features were increasingly eradicated: the Little Russia gubernia was abolished, and the former territory of the Hetman state was divided into two gubernias—Chernihiv gubernia and Poltava gubernia—although both were governed by the same military governor; elective judicial and administrative offices for the nobles were abolished in 1802; education was Russified (the Kyivan Mohyla Academy was turned into a theological academy); Right-Bank Ukraine was regarded as a Polish land and was tied economically and administratively to the Polish Kingdom, which, through a personal union, became part of the Russian Empire. The Russian wars and conquests (Georgia, Finland, Bessarabia, Azerbaidzhan) drained Ukraine's population and economic resources. The harm that Alexander's policies inflicted on the Ukrainian people could not be compensated for by such favorable measures as permission of transit trade with Western Europe, the opening of the free port of Odesa, the founding of Kharkiv University, Nizhen Lyceum and Odesa Lyceum, and the restoration of Magdeburg law to Kyiv. The policies of Russian centralism provoked a natural reaction in Ukraine. National consciousness began to rise and found expression in the activities of individual patriots (Istoriia Rusov), of sociocultural groups, such as the Freemasons, and of illegal political organizations, such as the Little Russian Secret Society. Peasant unrest and revolts in the military settlements, as well as the growth of the liberal-revolutionary movement (the Decembrist movement and the Polish independence movement), led to a very tense political atmosphere. The effects of the suppressed tensions became evident soon after Alexander's death, during the reign of Nicholas I.